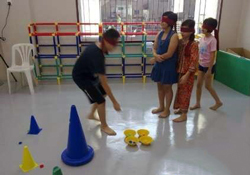 Midbrain activation is a method to stimulate and balance the left and right brains, including activating intuition capability, which lays in the right brain, so that the children would have capability to do things with their eyes closed. With this intuition active, when the children grow up their right brain would remain active and not dominated by the left Brain, provided they seriously practice it. So, nothing to wonder, this is the most spectacular method to activate the brain, and may be directly proven for its awesomeness after activation. So, if your child is still in his/her 5-15 years, you'd better not postpone again and immediately conduct the activation, because after 15 years of age, it's very difficult to do that. Please do no regret if the age passes by, because intuition is very difficult to be activated when a person matures. Human brain consists of right brain and left brain, and they will function optimally if the left and right brains are in equilibrium. But this is a rare condition because most people develop and mature while dominantly using their left brain. How can we create a balance between the left and right brains? The answer is that the brain must be stimulated since our childhood, i.e., between the ages of 5-15 years. Introduction » Midbrain activation training is one that is able to activate the brain waves called alpha-theta in a child, where these waves are able to activate the super intuition, and this is directly proven. What makes it interesting, exciting is to make the child Read, Write, Paint and do some activities with his/her eyes closed. 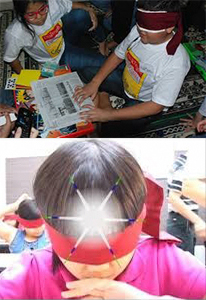 The children are able to read and do anything with eyes closed, such as guessing a card, color, reading a newspaper's headline,guessing something inside a closed box, guessing something behind a wall, walking/cycling/ shooting with eyes closed, playing games on a PC with eyes closed, etc. Mid Brain Activation or ESP Enhancement Program has recently been spreading well all across the world. Generally speaking, the countries already conducting brain activation are: Japan, India, Singapore, Russia, Tibet, Malaysia, Indonesia, Australia, Thailand, China, Hong Kong, and many other countries to follow. Japan has in fact conducted the research for 40 years. Other countries all apply scientific method (with technology). BrainMagicTM conducts a unique Train the Trainer program and allows you to learn and fine tune the program so that you are confidently able to conduct this wonderful program with your students at your location. Lifetime use of all audio, video, music, gym exercises, games modules. Create unlimited student practice modules at no extra cost. No renewals, No franchisee fees, No royalty. Just 100% profit. All software provided will be offline, totally under your control. You could take a step further and Create your own franchisee network.